﻿Our Blue Moon is located on N. Canyon Boulevard, close to the County Fairground, in the town of John Day, Oregon. It is a perfect vacation home for families or an ideal location as a corporate lodging facility for those coming for a few days on business in the valley. The Blue Moon is located close to all activities happening in the John Day Valley. It is central to the entire county including the Strawberry Mt. National Wilderness, the Blue Mts., the John Day Fossil Beds Museum and Interpretive Center, Kimberly Orchards, the entire John Day River System with many swimming and fishing holes, the High Plains of Seneca to the South with Silvies Ranch. The Kam Wah Chung Chinese Museum and Interpretive Center are within walking distance to the Grant County Fairground and parks and downtown. The Blue Moon is completely furnished with a complete kitchen and all the amenities of a nice country retreat, though you won't be roughing it. The house sleeps 6 in three bedrooms, each with a queen bed. 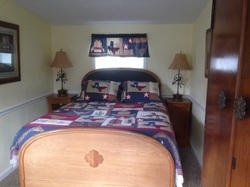 The 3rd bedroom is an In-Law Unit off the back yard with a sitting room attached. There is one full bathroom in the home, with a laundry area and pantry on the back porch. We provide Internet, Dish TV and a CD player with numerous videos. Outside we have a private fenced back yard, including a patio set with umbrella and a Weber grill. 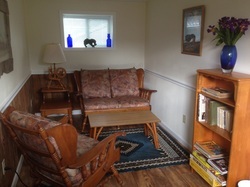 The front porch is entirely enclosed with seating area for lounging and a café table for morning coffee. The driveway has a carport at the back of the house. Street parking is also easily available right in front. The Blue Moon is totally furnished and equipped. Just bring your suitcase and your groceries. It is beautiful, quiet, safe and clean. Amenities: Fully furnished, Air Conditioned, 3 Bedrooms, 1 Bathroom, 1 vehicle carport, In-Law Unit, Linens Provided, Washer/Dryer, Off Street Parking, Heating with Toyo Stove, Eden Pure Heater, Private back yard with Webber grill and outdoor seating, Downtown setting and close to parks, etc. Beds: Two Queen Beds in House, One Queen Bed in In-Law Unit. Kitchen: Full Kitchen, Cooking Utensils Provided, Refrigerator, Microwave, Coffee Pot/Blender/Toaster, no dishwasher available. Suitability: Dogs allowed (There is a $10 a day charge per dog and clean up is required), Kid Friendly, No Smoking Allowed in the House or In-Law Unit. ﻿﻿$125/night for up to 3 persons, with a two night minimum. Base rates are based on 3 people. Add $30 per night/per person for additional people. There is discount for stays over 5 days. We are also required to charge a 9% room tax.